LAS VEGAS – The fastest growing, and youngest, of the WMC divisions, the Men's 40 and Women's 40 and 50 age divisions took center stage, Sept. 28 – 30. The third session also featured the inaugural International Co-Ed Division. A total of 147 teams participated across nine divisions. Starting with the 10-team Women’s 40 Major Division, TKP 40s (CA) took home the title, going 2-0 in seeding play and 4-0 in bracket play, including an 18-5 win over Broken Dollz (CA) in the championship game. TST (CA) bounced back from an 0-2 showing in seeding play, as well as a loss to open bracket play, with five straight wins in the elimination side of the bracket to finish in third place. Fun Bunch (CA) rounded out the top four finishers. Kryptonite (FL) entered bracket play as the top seed following its 16-9 win over Wikkd (CA) in the US National Championship game. The team would fall short of the completion of the Triple Grand Slam. For Kryptonite, it marked the teams third straight US National Championship victory. In the 17-team Women’s 40 AAA Division, Hawaiian Connection, the No. 12 seed, rolled through bracket play with a perfect 5-0 record, including a 20-15 win over Colorado Ohana in the championship game. Colorado Ohana began bracket play with three straight wins, before falling to Hawaiian Connection, 16-14, to drop down to the third-place game. Colorado Ohana would bounce back with a 9-8 win over Old Nasty Curves (CA) to get to the championship game. Old Nasty Curves, the third-place finisher, made a strong push through the elimination bracket with four straight wins after dropping their second game of the bracket, also against Colorado Ohana, 8-3. Pro Moves (CA) rounded out the top four finishers. CCS Fireballerz (CA) was the default US National Champion with no opponent from the East. The team would fall short of a bid for the Triple Grand Slam going 1-2 in bracket play. In the three-team Women’s 40 AA Division, Dames Got Game (AZ) posted a perfect 3-0 record in bracket play, including a 14-13 win over Guam-Team Sotta in the championship game. Guam – FIGO Islanders finished third. 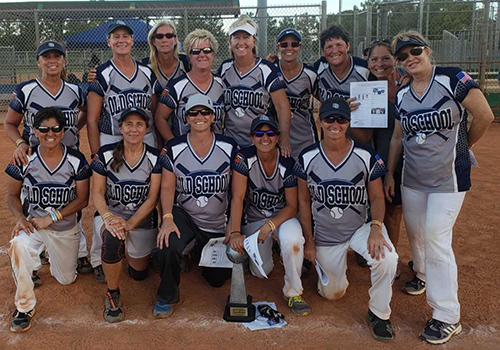 The six-team Women’s 50 Platinum Division would see the completion of a Triple Grand Slam, as Old School (CA), the default US National Champion for the Major division, won the division with a 9-3 victory in the “if” game over Stix With Impact (CA). Old School began bracket play with a loss to Stix With Impact, 16-8, to drop down to the elimination side of the bracket. Old School would then run the gauntlet, winning six straight games, including back-to-back wins over Stix With Impact in the championship and “if” games. Arizona Dream Team finished in third place, while LOL-Legit Ol’ Ladies (CA) rounded out the top four finishers. Dreamgirlz (VA) was the default US National Champion in the Major Plus division. 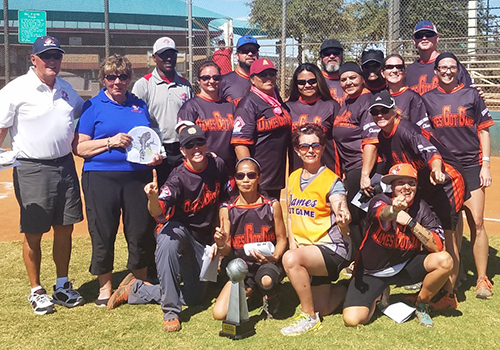 The seven-team Women’s 50 AAA Division featured B.O.O.B.s and H-Town Sisters with Bats (TX) in the championship game, with B.O.O.B.s taking the title with a 21-14 victory. B.O.O.B.s defeated H-Town Sisters w/ Bats, 14-9, to get to the championship game, while H-Town advanced to the championship game following a 14-13 win over OnFIre/Afoa Insurance (CA) in the third-place game. OnFire/Afoa Insurance, the default US National Champion, made a strong push through the elimination side of the bracket with three straight wins, en route to their third place finish. Who’z Yer Daddy-50 Shades of Grey (WA) rounded out the top four finishers. Moving to the 19-team Men’s 40 Major Plus Division, Suncoast Adidas (FL) would complete the second Triple Grand Slam of the third session, as the team edged out Prestige/Elite Sports Orange County (CA), 33-32, in the US National Championship game, to lock up the No. 1 seed in bracket play, where the team posted a 5-1 record, including a 28-21 win over Bellator (CA), in the “if” game. Suncoast held off a furious rally by Prestige in the US National Game, as the team headed into the bottom of the open with a 33-24 lead. The nine-run cushion was just enough, as Prestige plated eight runs in the bottom of the open to fall short, 33-32. Bellator won its first three games in the bracket before falling to Suncoast, 30-15, to drop down into the third-place game. Trailing 25-26 heading into the bottom of the open, Bellator scored the six runs it needed to eliminate Classic Glass/One Nation (CA), 26-25, and advance to the championship game. Bellator would get its revenge in the championship game against Suncoast, holding on to a 33-32 win, on the strength of a 12-run rally in the top of the open, to force the “if” game. GTS (ID) finished in fourth place. The largest division of the third session, the 65-team Men’s 40 Major Division, saw 12 teams advance to Championship Sunday. Of the 12, four would be in the driver’s seat, as Wicked Sports/PT Express (CA), Front Row/MVP Sports (TX), SBOB/ATHALONZ/VOODOO SPORTS (AZ), and Headbangersports.com (FL) all entered Sunday in the winner’s side of the bracket, needing to lose twice to be eliminated. Of those four, Headbangerssports.com got to the championship game unscathed, where they met up with DTA/KTE/SUP (CA), who entered Sunday in the elimination side of the bracket. 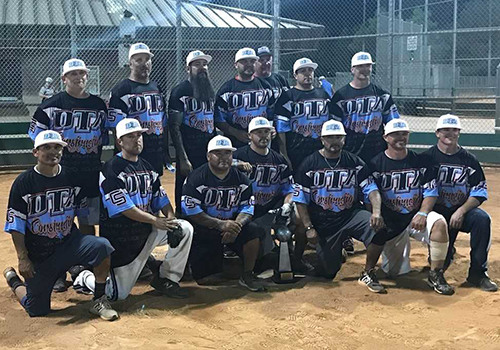 With their backs against the wall and needing to win out, DTA/KTE/SUP did just that, making an incredible run with seven straight wins on Sunday, including double-dipping Headbangersports.com by scores of 35-26 and 35-20, in the championship and “if” games, respectively. Wicked Sports/PT Express finished in third place, while SBOB/ATHALONZ/VOODOO SPORTS rounded out the top four finishers. Front Row/MVP Sports and One Payment/Euler-Hermes (FL) finished just outside of the top four. MTC 40’s (CA) won the US National Championship game with an 18-14 victory over S2S/.40 CAL (FL). In the 16-team Men’s 40 AAA Division, Tucson Hammertime (AZ) posted a perfect 5-0 record, including a thrilling, 35-34, walk-off win over NM Punishers Dudley/Elite in the championship game. Trailing 34-32 heading into the bottom of the open, Tucson Hammertime notched the three runs it needed to complete the comeback win. NM Punishers Dudley/Elite was coming off of a walk-off win of their own, as the team scored four in the bottom of the open in third place game to knock off Red Eye/RHSK Softball (PA). Shut-D finished in fourth place, following a three-win run in the elimination side of the bracket. Mach One (WA) entered bracket play as the top seed following its 11-7 win over Live! Casino (MD) in the US National Championship game. After falling 18-17 in their opening game against Whatever (AZ), Mach One made a strong push through the elimination side of the bracket with four straight wins to finish just outside of the top four, falling just short of a potential Triple Grand Slam title. In a tournament first, the LVSSA/SSUSA World Masters Championships held an International Co-Ed Division. Four teams participated, with two teams from the US, one team from Germany and one team from Panama. The teams played a three-game round robin to seed, as USA Blue posted a perfect 3-0 record to earn the No. 1 seed. USA Blue continued its strong play in the bracket, going 3-0, including a 20-17 win over Panama Police, to complete a perfect weekend. USA Red finished in third place, while Bavarian Royals (Germany) finished in fourth.